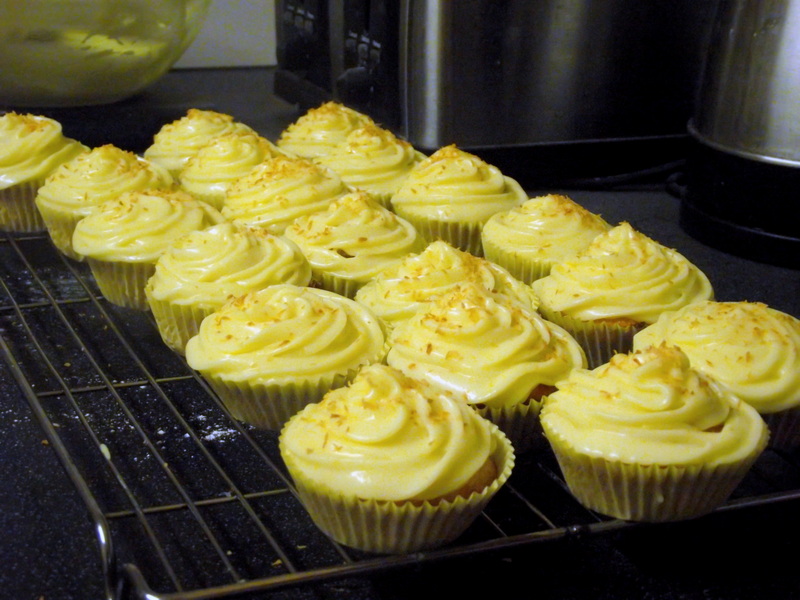 These were the result of a surfeit of egg yolks and mango, and the need for some sunshine in a very grey week (hard to imagine in this scorcher, I know). The sponge is coconut with a mango curd centre, topped with mango(ish) icing and toasted coconut – the perfect thing if you want to pretend you’re in a 90s Bounty ad. I based the recipe on this one here, and you will need to make the curd the day before. 1. 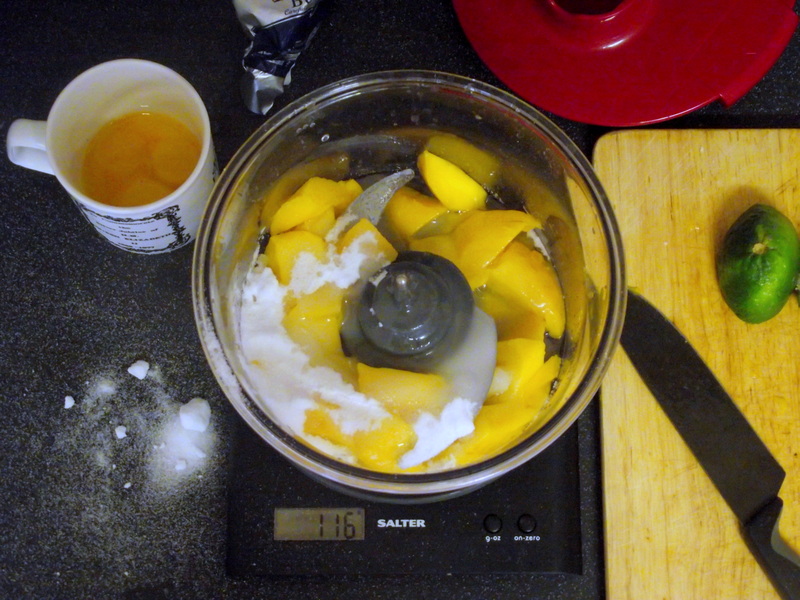 Blend the mango, sugar, lime juice and salt until smooth. 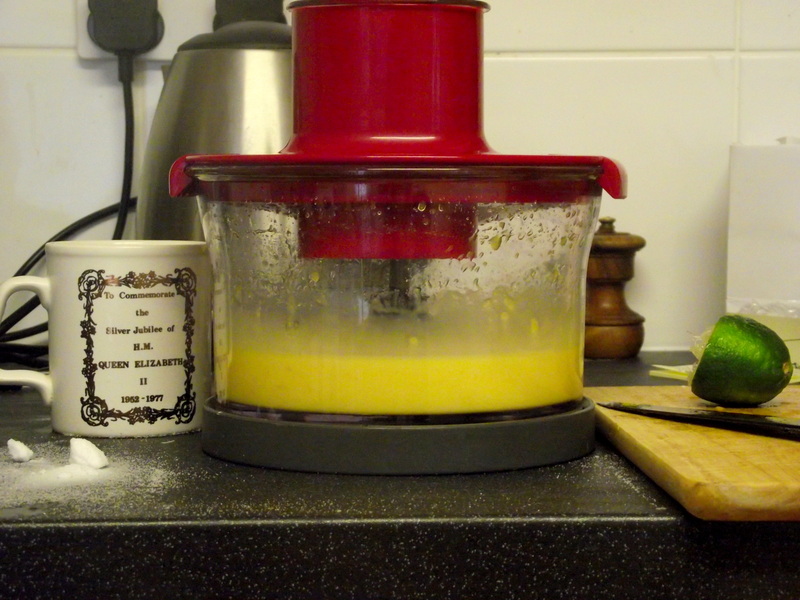 Add the egg yolks and blend again. Strain through a sieve into a large bowl over a pan of simmering water. 2. 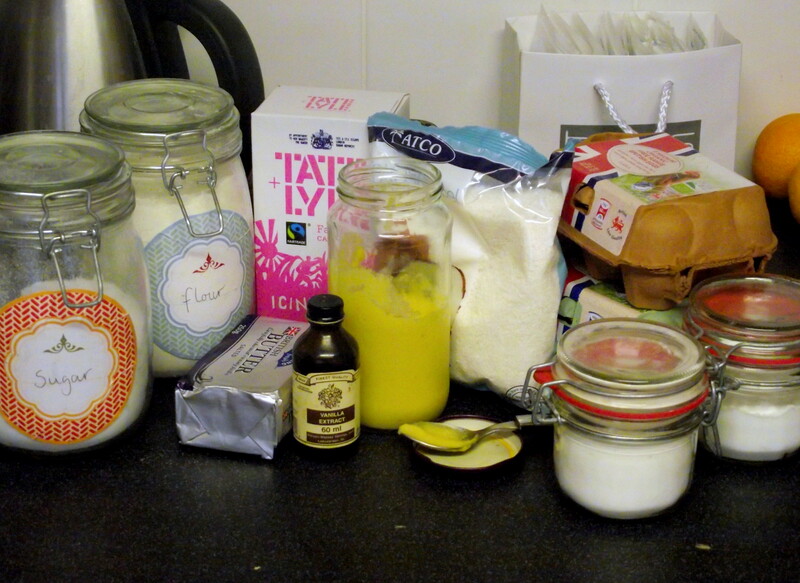 Whisk the mixture until thick – if you have a sugar thermometer, it should read 170C. I don’t, which is why I didn’t do mine long enough and the next day it was runny and grossly eggy. If you do the same don’t fret, I put mine back in a pan and heated it for a while until it was thick enough to coat the whisk. 3. 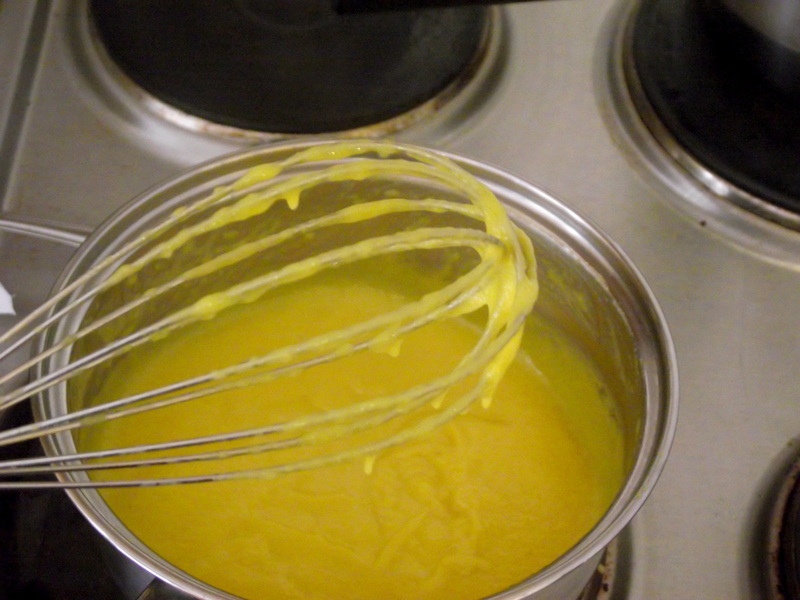 Once the puree and egg mixture is thick enough, whisk in the butter piece by piece. Pour into a jar and chill overnight. 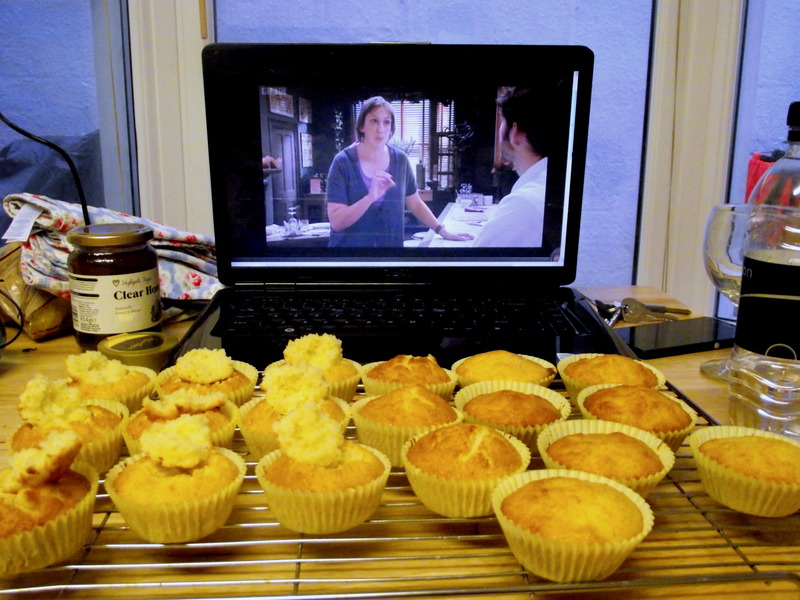 It should keep for two weeks or so, which is lucky as it took me bloody ages to get round to making these cakes with it. 1. Cream the butter and sugar until light and fluffy. Add the eggs one at a time, then the vanilla, beating well after each addition. 2. Fold in half the flour, then half the buttermilk, then the remaining flour (plus baking soda, baking powder and salt), then buttermilk. Technically you should sift together the dry ingredients first then add everything in thirds, but in my eyes that counts as unnecessary washing up. (Not that I actually do it, but the washer upper might get stroppy). 3. Fold in the dessicated coconut. If you happen to like raw cake batter, this stuff tastes amazing. 4. 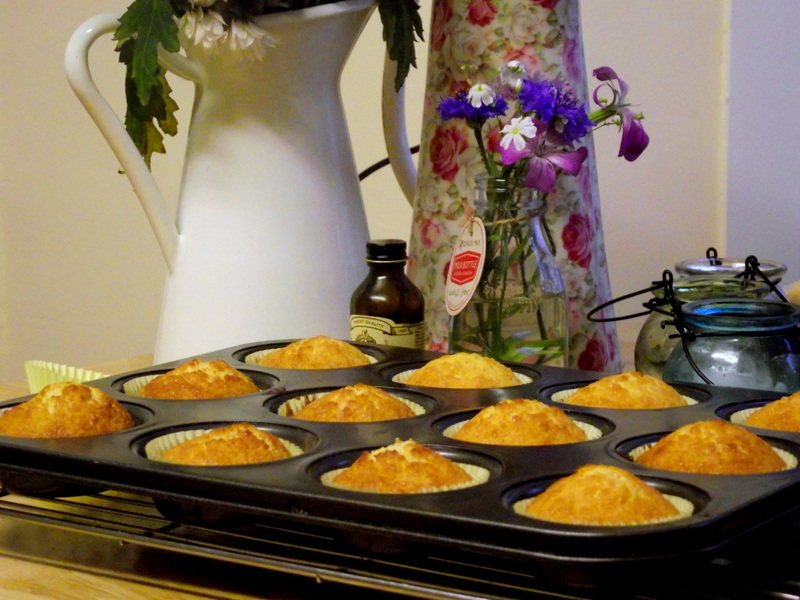 Fill up your cake tins and bake at 180C for around 20-25 minutes. Leave to cool completely. 5. 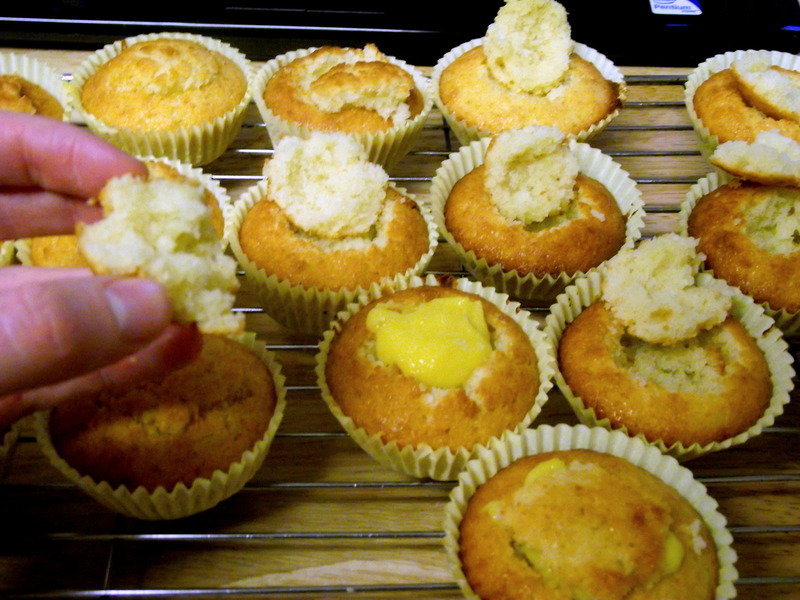 Using a spoon or small knife, dig out the top of the cakes to make space for the mango curd. Keep the tops but eat the nice fluffy bits as you go. 6. 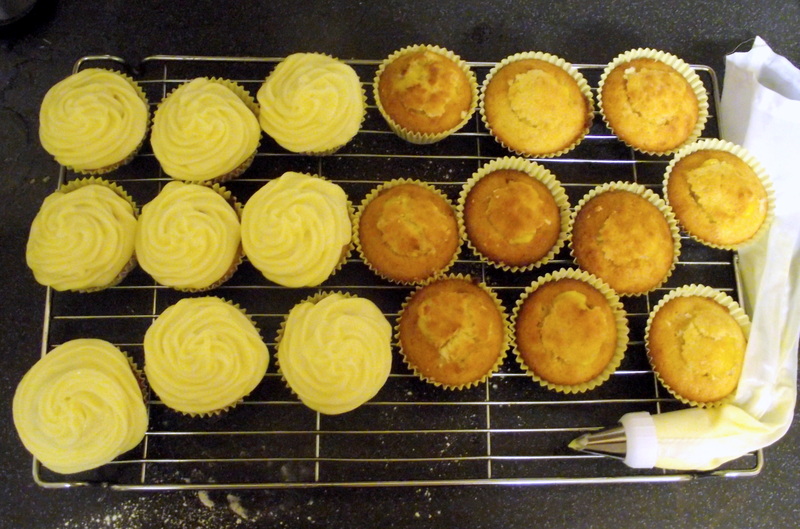 Put a blob of mango curd in each cake then replace the lids. 7. 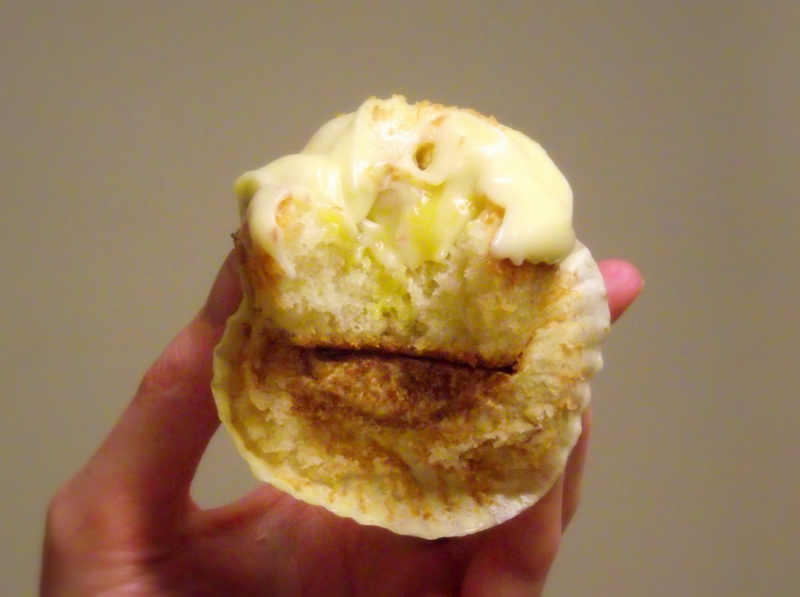 Mix together the cream cheese and butter, add the vanilla extract and any leftover mango plus enough icing sugar to reach the right consistency/sweetness. I find cream cheese icing is always quite runny so you might want to put this in the fridge before piping. 8. Sprinkle over a little more dessicated coconut, toasted briefly in the oven. Yummo!